When the circuit is connected with the power supply then we all know current will flow from the 1K resistor to the transistor's end now, a LED is connected parallelly so, at the first of the circuit the base has no voltage. If we push the Push switch what happens is that the capacitor started charging and stores some charge. Now when we release the push switch the capacitor started discharging through 100k Resistor. 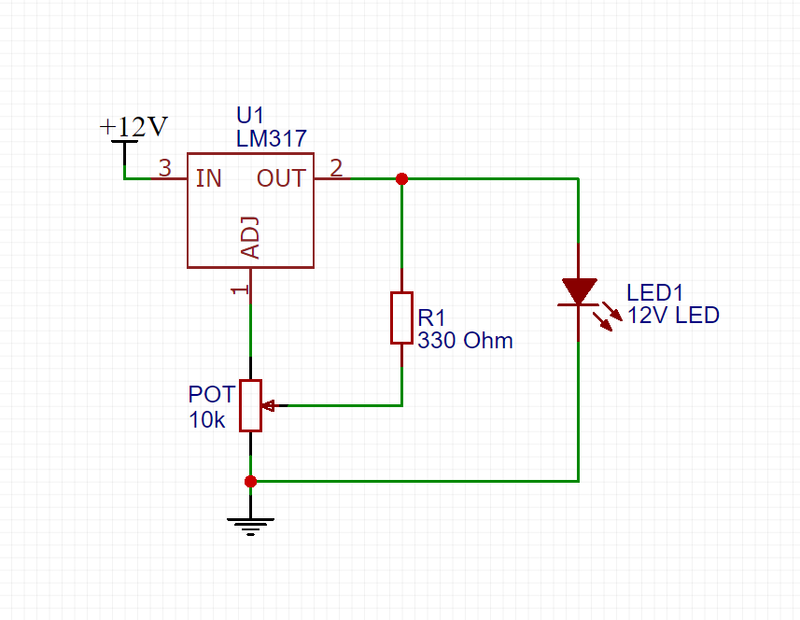 Here is a simple circuit for turning on a system after a certain time. Just with some simple components like resistors and capacitors and Transistors. 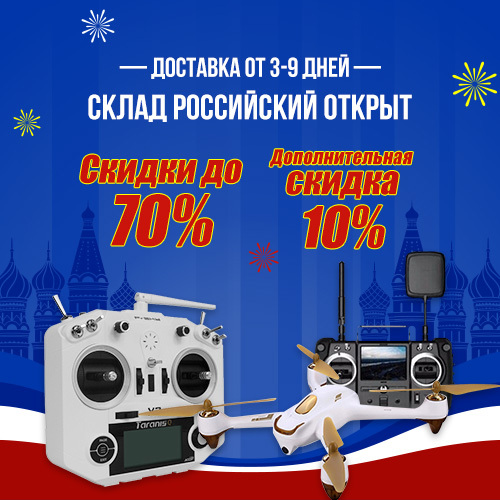 You can buy any components from any local store also. For those who want to buy the components from online, I have given links to India as well as anywhere from Globe. The circuit is very easy to understand. This is based on a simple transistor's circuit. When the circuit is connected with the power supply then we all know current will flow from the 1K resistor to the transistor's end now, a LED is connected parallelly so, at the first of the circuit the base has no voltage. So it means that transistor will not be conductive so it means that transistor's collector and the emitter pin have no dynamic connections so it means that Transistor's collector and the emitter pin acts as an open circuit. As we know the LED connected parallelly so it means that at the first of the circuit the current will flow from the 1k resistor the LED and to the GND. If we push the Push switch what happens is that the capacitor started charging and stores some charge. Now when we release the push switch the capacitor started discharging through 100k Resistor. The voltage came to the transistor's base so it means that the transistor became conductive. So Current will flow from transistor's collector to emitter, in this case, the LED will not run because the current will always frow from the shortest path so If it goes from the LED the. It will be a resistive path so it will only flow from the Transistor, as a result, the voltage comes through a 1k resistor and came to virtual GND. The current flows from the resistor now dissipate through heat. This process will work until the capacitor's charge fully discharges. When the capacitor is fully discharged then no current will flow from the transistor si it means that the Transistor Will not more be conductive as a result the Transistor became off as result the process will be repeated once more the LED will run because of 1K resistor. This process will be followed repeatedly. In this Circuit, we don't have utilized any type of microcontroller, as a result, the making cost of this circuit will be very low. Hello, Everyone today in this article I want to discuss simple emergency Buzzer alarm Circuit. The circuit consists of some basic components like resistors, Transistors, Buzzer alarm, and a LED. You can run the circuit between 9v to 12v of voltage. If you cut the loop wire then the buzzer and the LED will be On condition. Watch the YouTube video from Creative Creator for more information about Emergency Buzzer alarm. This is a basic NPN Transistor Circuit which is used in the circuit. The basic principles NPN transistor is that if you give voltage into the transistor's base then the transistor became conductive and current flows from transistor's collector to Emitter. If you connect any series load then the circuit will run the load. At first, the loop wire is connected. so it means that the Base and the Emitter point is short-circuited. So, for this reason, the current goes to the shortest path as possible. 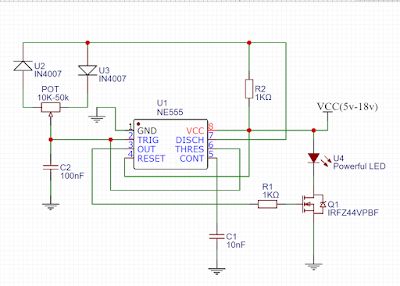 So current will flow from Vcc to GND through 2.2k Resistor. So, no current will flow into the transistor's base and for this reason, the transistor will not be conductive. As a result, the current will flow from collector to Emitter. And for this, the LED and the Buzzer will not work. Now let's say I have cut the wire which is short-circuited before. (I mean Base and Emitter Connected wire). 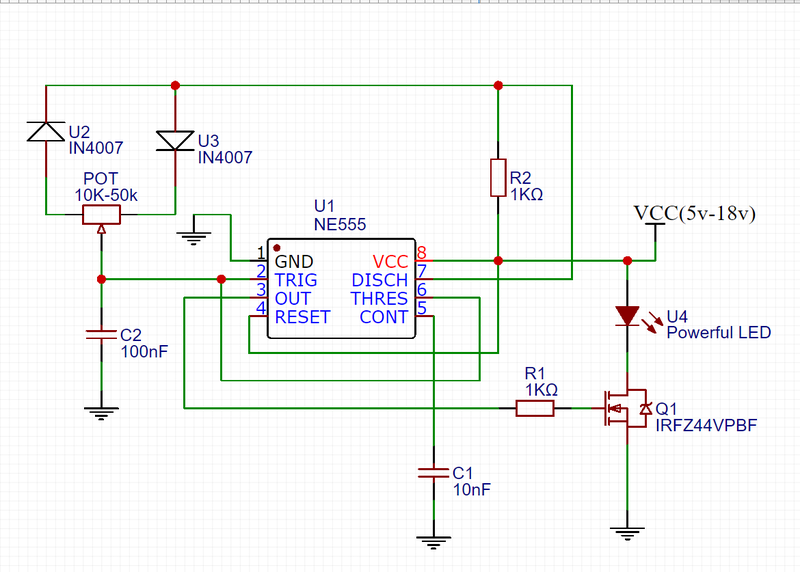 Now if we turn on the power supply then the current flows from Vcc to transistor's Base through 2.2k Resistor. For this reason, the transistor became conductive and the current flows from the Transistor's collector to Emitter and the load which is connected in series will be on for this reason. (Here the load is parallelly connected RED LED and the Buzzer). For this reason, the buzzer gives beep sound. And the circuit will work. Always check the Transistor number before using it. Otherwise, it may be a PNP transistor. Check out all the data sheet and pinouts. A different transistor has different pin numbering. How to Flash 220V Light Bulb ? 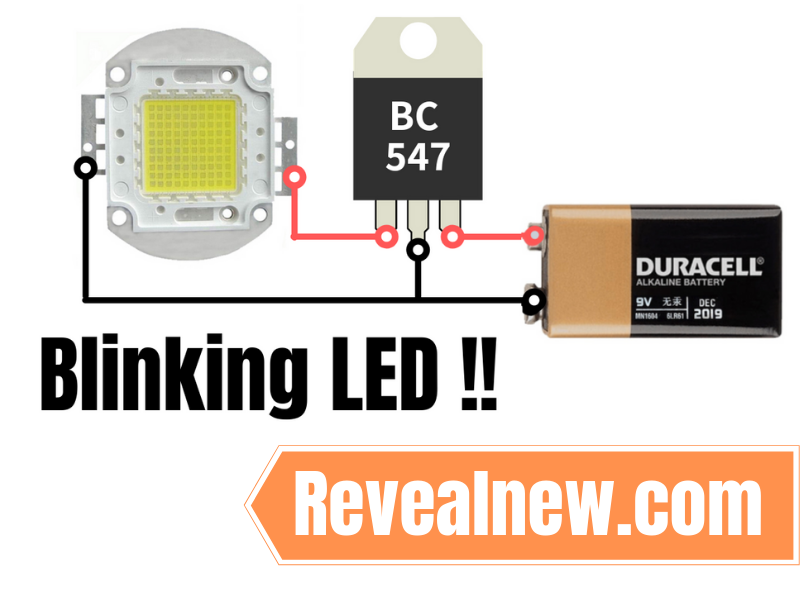 Hello Everyone, Today in this article I will discuss Simple 220V Light Bulb Flashing Circuit. For this project, I will use a Fluorescent Lamp Starter It will be used as a 220V Light Bulb Flasher. You don't need any additional components for this project. There is a filament inside of the starter It works with any type of Fluorescent lamp starter. There is a simple logic is that when the terminal of the stater is heated then the thermostats plate increases and became short-circuited. So it means that current flows from the light became turned on. After that, the thermostats cooled and then starter acts like an open circuit. And then the light became off. I have used 100W LED Bulb as a load you can use this as well. This is a very simple circuit which is made up of fluorescent lamp starter. First Watch the youtube video then It will be easier to Understand. How Does the Circuit Works? There is a filament inside of the starter It works with any type of Fluorescent lamp starter. There is a simple logic is that when the terminal of the stater is heated then the thermostats plate increases and became short-circuited. So it means that current flows from the light became turned on. After that, the thermostats cooled and then starter acts like an open circuit. And then the light became off. I have used 100W LED Bulb as a load you can use this as well. This is a very simple circuit which is made up of fluorescent lamp starter. Today in the article I will discuss Simple touch sensor/ Transistor Touch sensitive circuits. Here I will discuss n channel MOSFET touch-sensitive circuits. MOSFET has 3 pins gate drain and source. The point gate is used for turning on and turning off the MOSFET. Basically, we use a PWM signal for controlling the MOSFETs. But here we are using our Hand as a resister which can activate or deactivate the MOSFET. Here is the YouTube video from Creative Creator, This will help you with more clarification. How the simple touch sensor circuit works? MOSFET has 3 pins gate drain and source. The point gate is used for turning on and turning off the MOSFET. Basically, we use a PWM signal for controlling the MOSFETs. But here we are using our Hand as a resister which can activate or deactivate the MOSFET. If we touch the gate Pin and the Vcc then the current flows from our hand to the gate pin. There it suddenly activates the MOSFET. And the current flows from drain to source. In the MOSFET there is an inbuilt capacitor this took the charge and stores the energy. The current will flow from drain to source as long as capacitor stores energy. Now if you touch the gate Pin and the GND Pin then the stored capacitor discharges and the current flow become lower. There will be higher resistance between drain and source. So, there will be no flow between drain and source. That is how the circuit works. Let's talk about the LED Blinking Circuit. 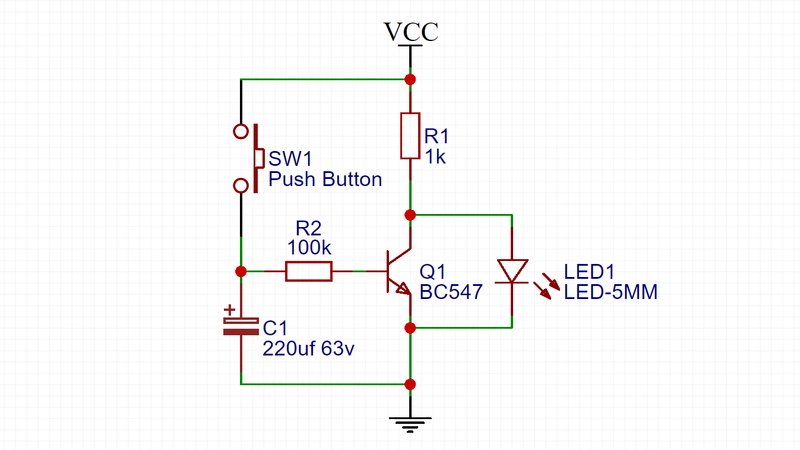 LED Blinking Circuit is an easy Circuit consists of 3 basic components like 1 Transistor, 3 RGB (Multi-color) LEDs. This is a Basic transistor Circuit. The LEDs are connected in series with the Base of the transistor. 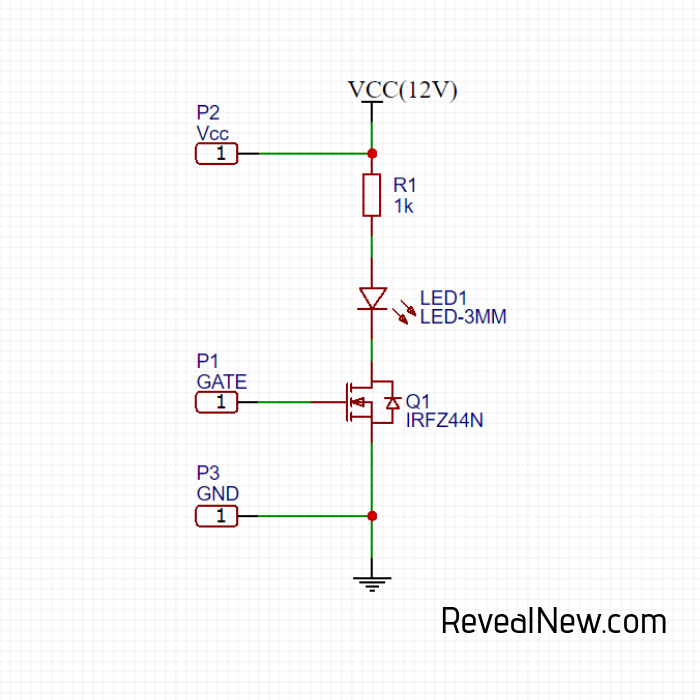 When the 12v Vcc is on then the RGB LEDs connected in series changes their color in a systematic way. The changing color triggers the transistors Base. As the Transistor Base Voltage is changing the amplified signal from the transistor also changing. I have connected 12v load LED at the transistor Output section. So it also blinks in a systematic way. 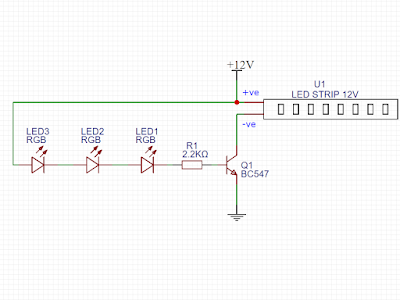 Here is the schematics of the LED Blinking Circuit. I have used Basic Components for making the Circuit. You can use a breadboard for testing purposes. This is a Basic transistor Circuit. The LEDs are connected in series with the Base of the transistor. 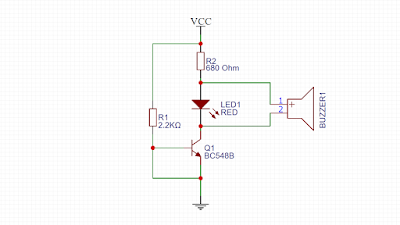 When the 12v Vcc is on then the RGB LEDs connected in series changes their color in a systematic way. The changing color triggers the transistors Base. As the Transistor Base Voltage is changing the amplified signal from the transistor also changing. I have connected 12v load LED at the transistor Output section. So it also blinks in a systematic way. I have used BC547 for the demonstration purpose. If you want to run bigger loads like RGB LED strips then I will highly suggest you to use High Power Output rated Transistor. As a power transistor, you can use N-Channel MOSFETs like IRFZ44N N-Channel enhancement type MOSFET. You can use Heatsink for Thermal Cases. You can also go one step ahead and try to improve the Blinking Depth by Changing the values of the Resistor Between 50Ohm and its above. As you are working with a transistor you might know that transistor is a semiconductor device. So it has some resistive characteristics. So the transistor 0.7v for international Characteristics. 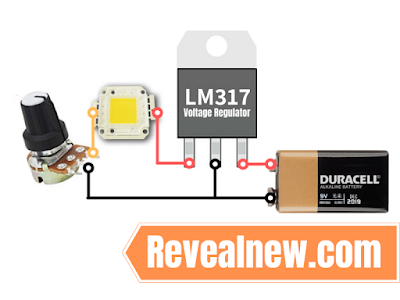 If you want to run 12V LED strips then I will suggest you go for 13v Power supply. For this case, the LEDs will Blink with its maximum brightness. 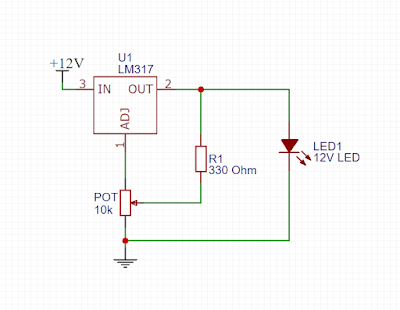 The Blinking LED circuit is easy. It requires fewer Components. Great for Hobby Projects. No I.C. required for Generating PWM. The circuit will Give You many blinking effects as 3 LEDs are in series, they all LED combines and gives Great blinking effects. The circuit is great for Hobby Projects but there are some problems with the Circuit. 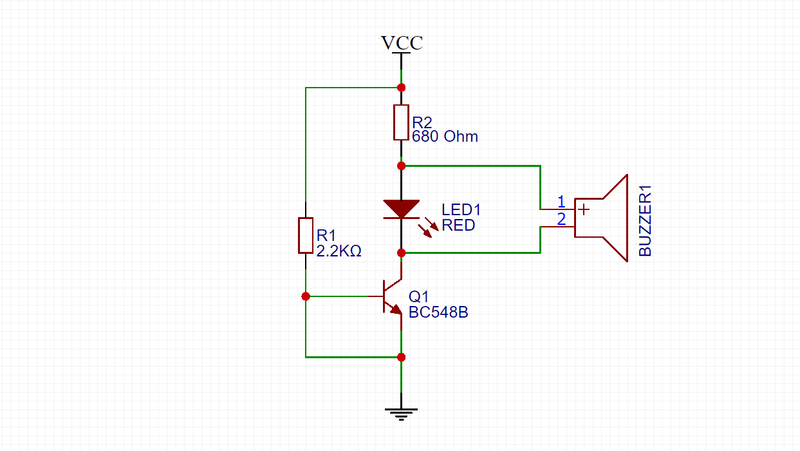 If the circuit runs with one RGB LED then the circuit will be effective. We used some simple components like LEDs for the Blinking. This will not give you as blinking Depth Compared with PWM signal from the NE555 timer. Those are the only corns I found in the Circuit. I will suggest you to make make the Circuit yourself and you should try to modify the circuit and send me your Schematics through Social media. If you have any doubt then feel free to write in the comments section. I read each and every from you guys. This motivates me a lot for writing articles for you Guys. In this article, we are talking about the LED dimmer circuit. 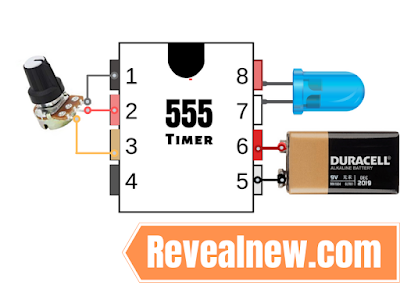 It is a basic circuit made out of 555 timer. 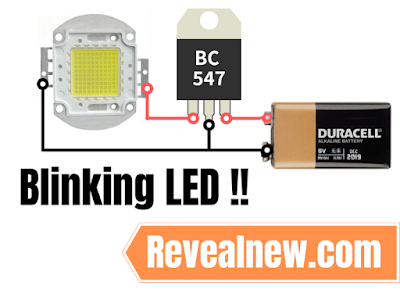 Let us try to understand the LED dimmer circuit. Watch the video until the end and you will understand Everything. Here I have tested the circuit and the LED Dimmer Circuit Works perfectly. 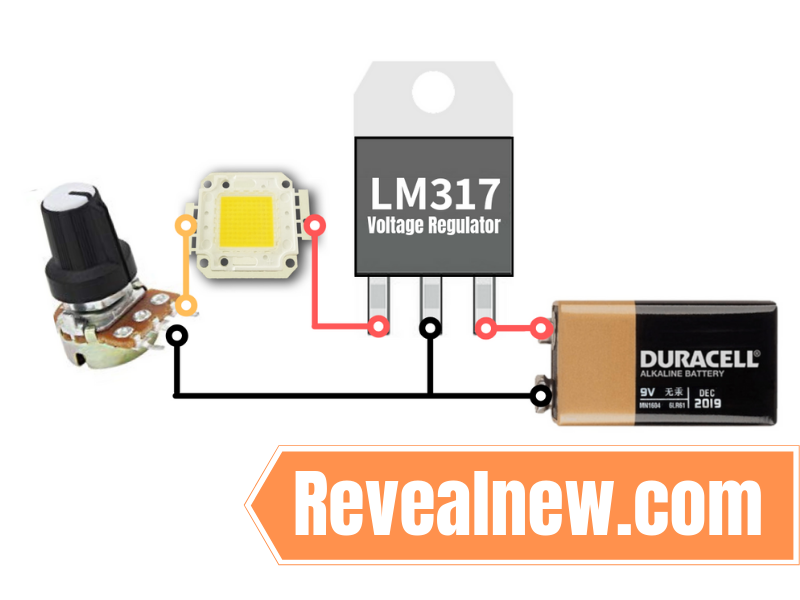 How does the LED dimmer circuit works? Here we are using 555 timer. You can control the duty cycles of the PWM signal by rotating the potentiometer. The PWM pulse coming from pin number 3 is driving an N-channel MOSFET. The MOSFET basically dims the LED when it gets slow PWM signal. you can use any engineering MOSFET for any power transistor as per your need. 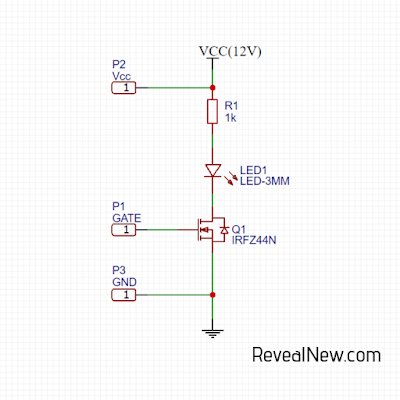 For my case of a LED dimmer circuit, I used IRFZ44N N-channel enhancement type MOSFET. You can use any type of MOSFET as a load you are connecting. I have made the circuit on Dot PCB Board. You can use a breadboard for testing purposes. This is a cheap build which takes all under $1. I have mentioned the potentiometer about 10k to 50k. If you find 10k is not working great for you then I will suggest you go for the 50k potentiometer. This will solve your low problem. 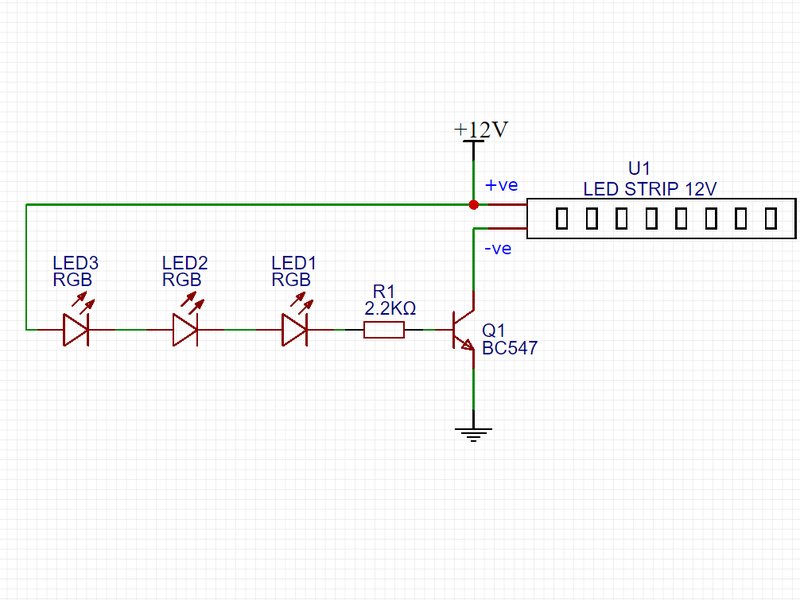 If you want to drive 12 volt LED strips then I will suggest you take a power supply around 13 volts. Because for the dimmer we are using a MOSFET, the MOSFETs has its internal resistance. show the most it will take. 7 volt for its work so when you are working with this type of MOSFETs you will add +0.7 volts For great results.